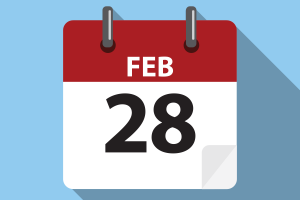 Renewal ended Feb. 28, 2019. Current, active licenses became delinquent on March 1, 2019. The fee to renew your PE license is $98.75, which includes a $5 mandatory fee to combat unlicensed activity. You are no longer required to report Continuing Education to the Board. Questions regarding Continuing Education should be directed to the CE desk at (850) 521-0500, ext. 113, or cedesk@fbpe.org. Please read the License Renewal page, which includes important information about status changes. FBPE cannot accept credit cards or checks over the phone. 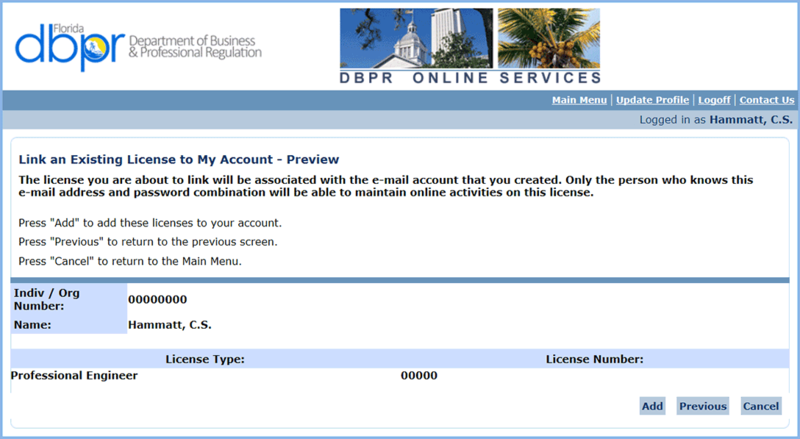 After you have successfully renewed your license, a PDF of your license will be automatically emailed to you within 30 minutes at the email address that you used to log into your myfloridalicense.com account. “Cancel” to end registration (which will result in the loss of all information you have entered). This how-to page is divided into sections depending on what needs to be done. Each section includes step-by-step instructions. Look for the tabs at the top with step numbers, and click each tab to view that step’s instruction and see the screen example. 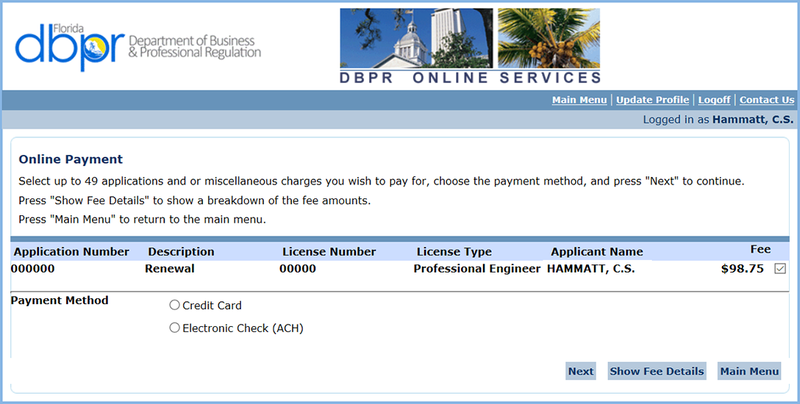 Keep this guide open in a separate browser window as a reference while renewing your license. 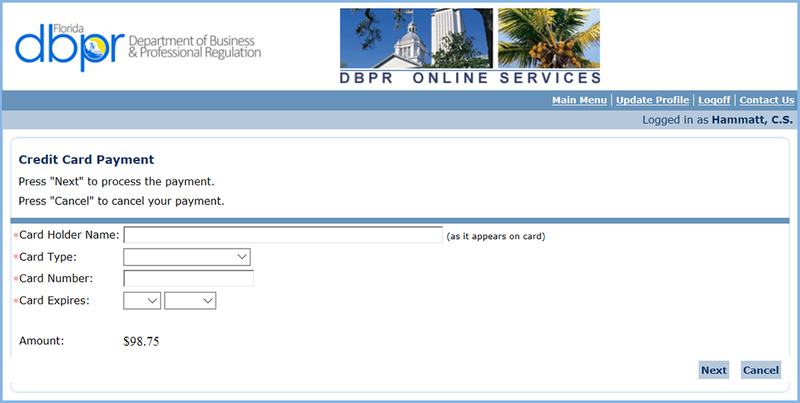 Licensure renewal starts with a visit to the Department of Business and Professional Regulation’s myfloridalicense.com website. 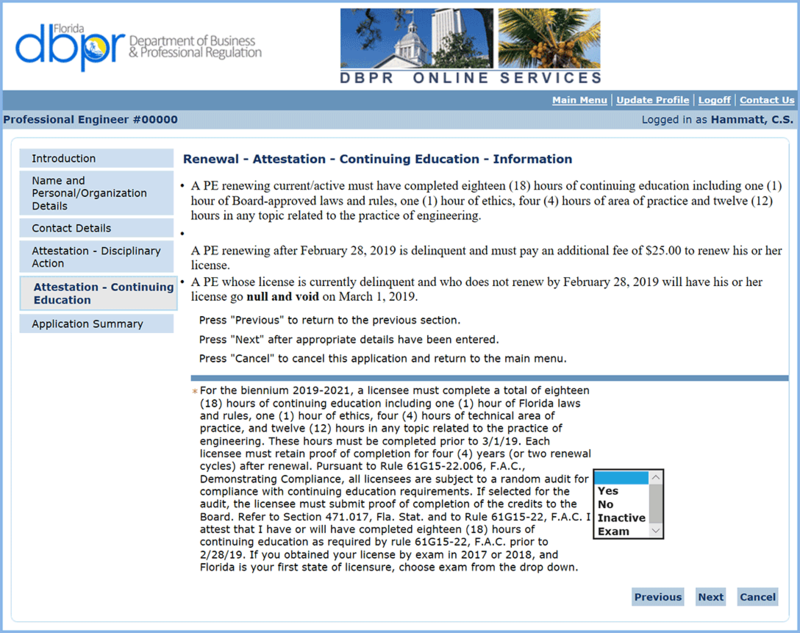 Click on each step tab below as you work your way through the process of updating and renewing your PE license. Go to myfloridalicense.com. Click on “My Account” in the blue box in the upper right. Select “Create My Account” at lower left, or enter your credentials to “Log in to Online Profile” on the right. 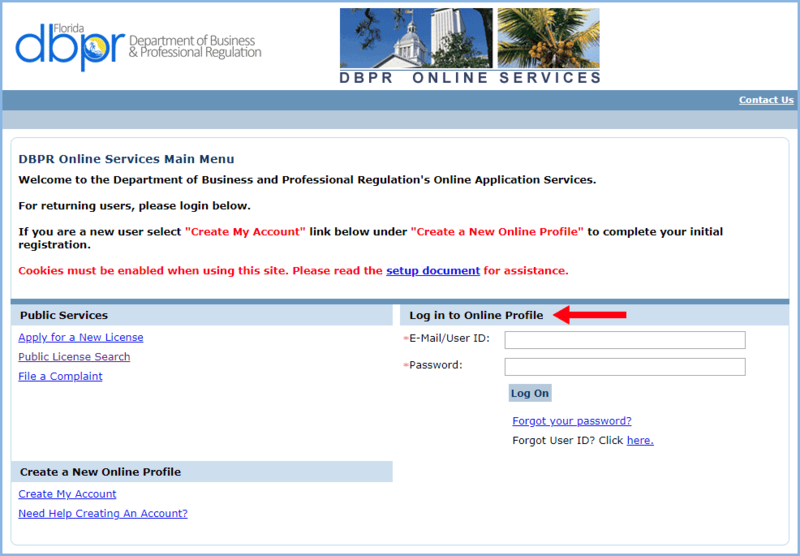 If you don’t have an account with the Department of Business and Professional Regulation, set up an account now. 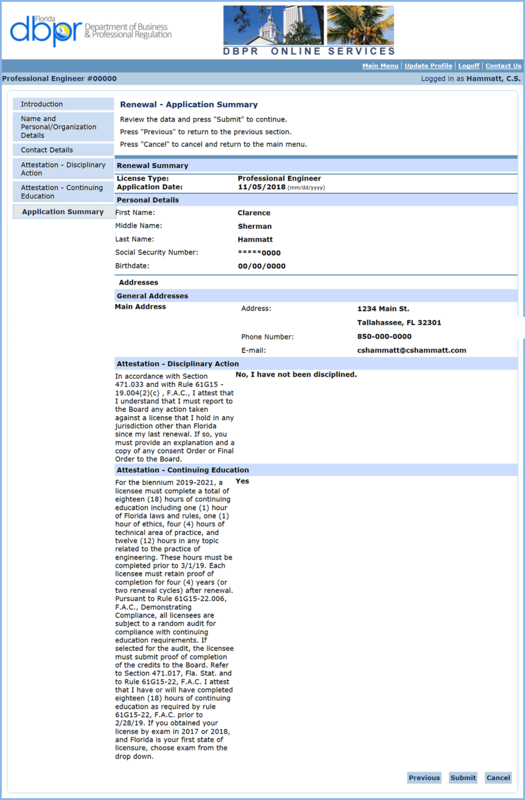 Fill out the required information on the User Registration page. Later, you will link all of your professional licenses, including your Certificate of Authorization, to this account. The email address you enter here will be the email address to which your license will be sent. Be sure to click the checkbox to use your email address as your User ID. When creating your answer to the Secret Question, we recommend that you make it a memorable, one-word answer, and that you write it down for safekeeping. A temporary password, similar to the one illustrated below, will be emailed to the address you provided. Use this to log into the system. 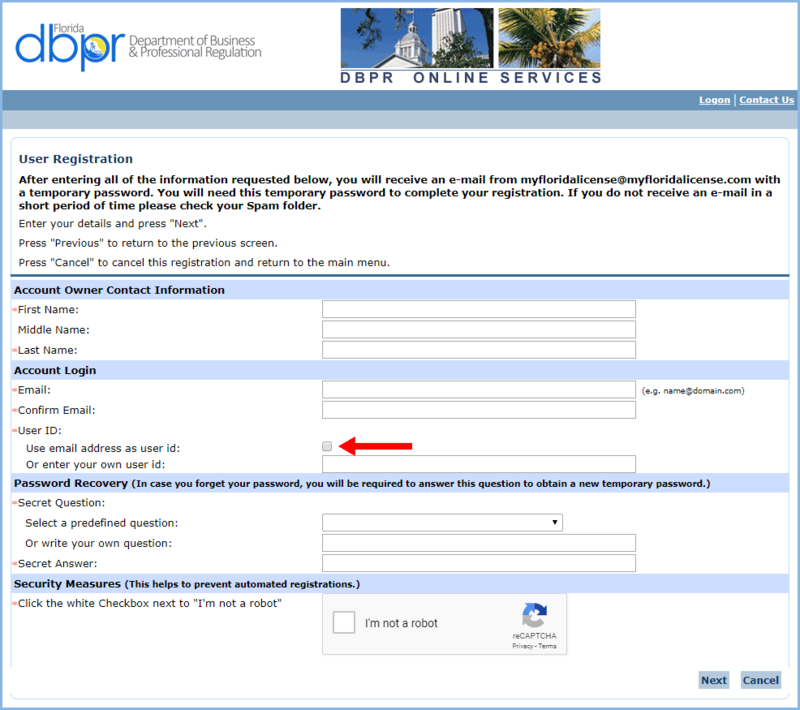 You must link your PE license or Certificate of Authorization to your online account in order to renew either. Confirm that you want to link your PE license or Certificate of Authorization to your account. Select “Engineers” as the Profession/Business in the drop-down list. On the Link an Existing License to My Account page, select “Professional Engineer” or “Certificate of Authorization” from the drop-down list, then enter your PE or CA number. Select “Next” to continue, “Previous” to go back a page to correct information, or “Cancel” to end registration (which will result in the loss of all information you have added). On the Security Measures page, enter the last four digits of your Social Security or Federal Employer Identification number, check the “I’m not a robot” box and follow the instructions. (Your code must match the number you provided to FBPE.) Select “Next” to continue, “Previous” to go back a page to correct information, or “Cancel” to end registration (which will result in the loss of all information you have added). On the Preview page, verify the information, then either select “Add” to accept, “Previous” to change the information, or “Cancel” to end the registration process (which will result in losing all of the information you have added). 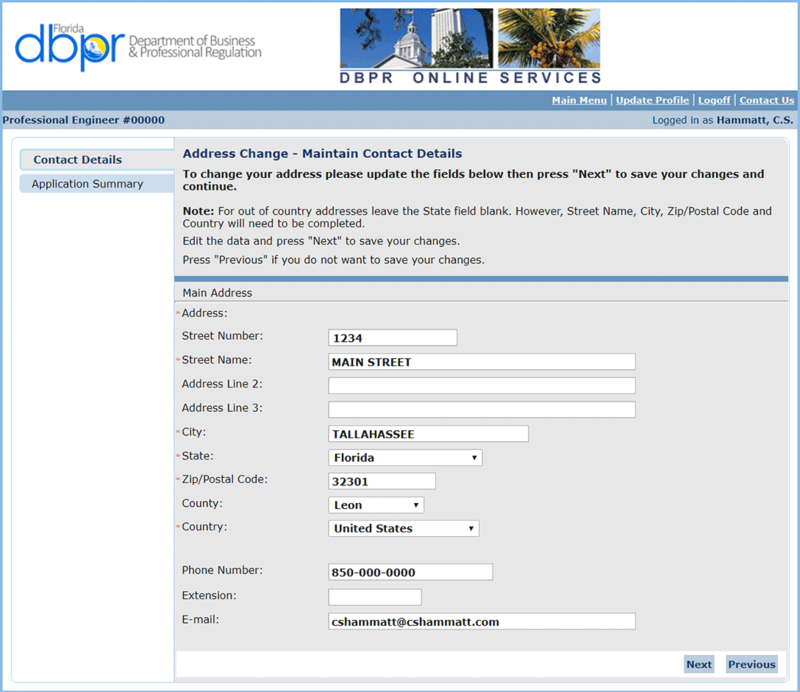 Licensees are required to keep their contact information up-to-date by Section 455.275, Florida Statutes. Confirm that your current mailing address, telephone number, and email address are correct. Please be aware that the email address listed in this section may not be the email address associated with your myfloridalicense.com account and therefore not the email address where your license will be sent. On the Main Menu page, select your license linked to your account to update your contact information. 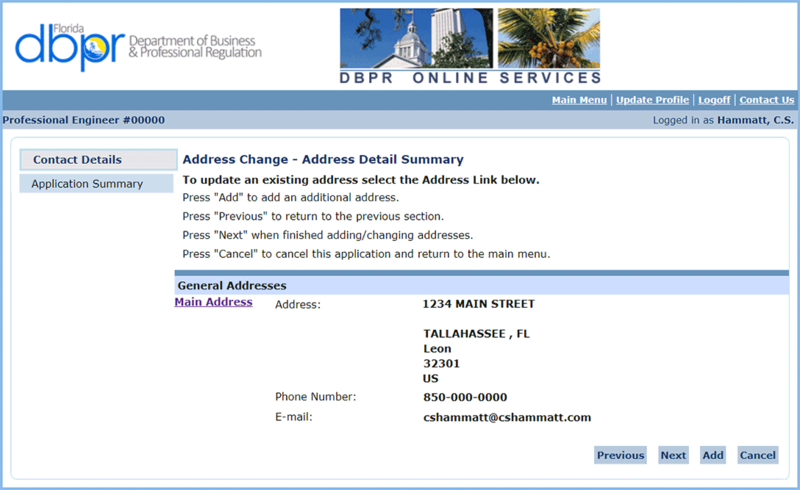 On the License Menu page, select “Address Change” to update your contact information. 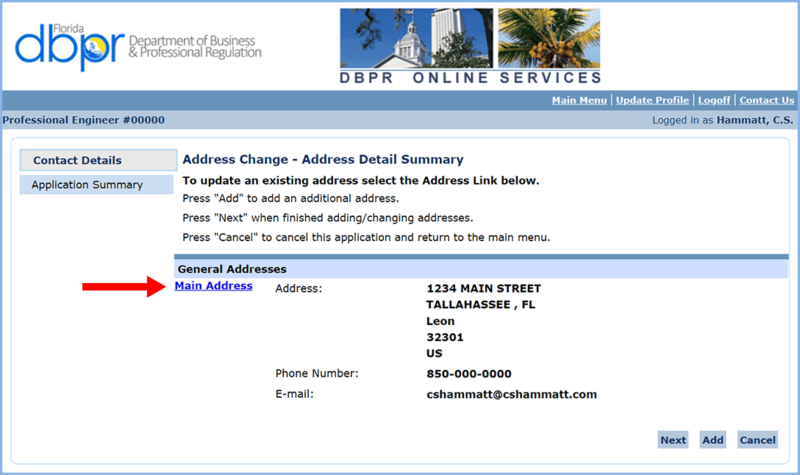 Click the blue, underlined link if you need to update your contact information. 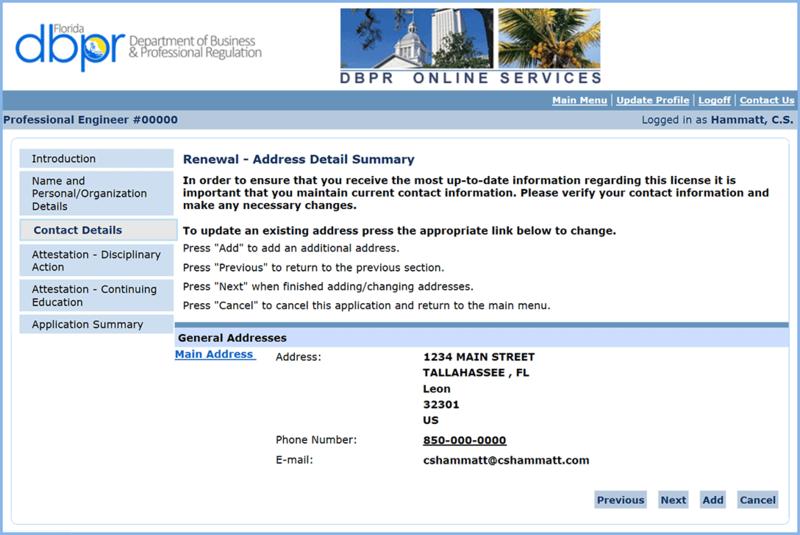 Your license will be emailed to the email address associated with your myfloridalicense.com account (the email address that you used to log in). 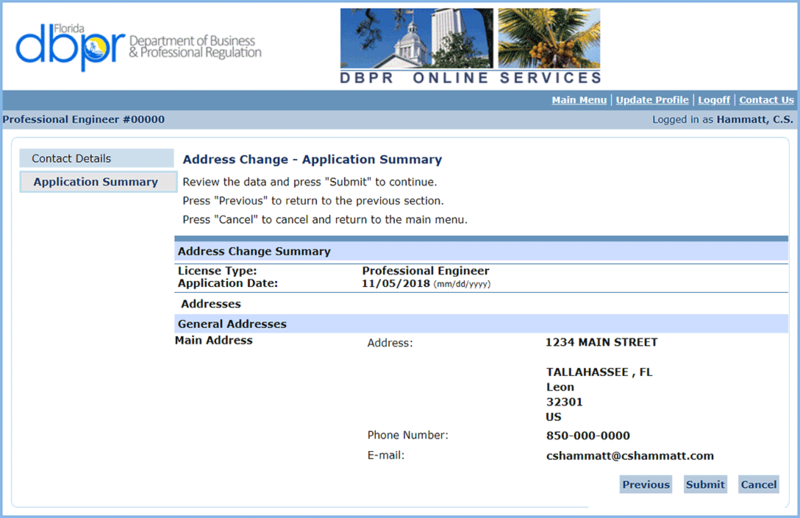 Changing the email address on this page will not change the email address where your license will be sent. You must certify that the information you have submitted is true and correct by selecting “Yes.” Then “Submit” to attest to the address change. After you attest to the changes, you will receive a confirmation on the website, as well as by email sent to the email address associated with your account. Follow these steps to renew your PE license. From the Main Menu page, select the license you wish to renew. 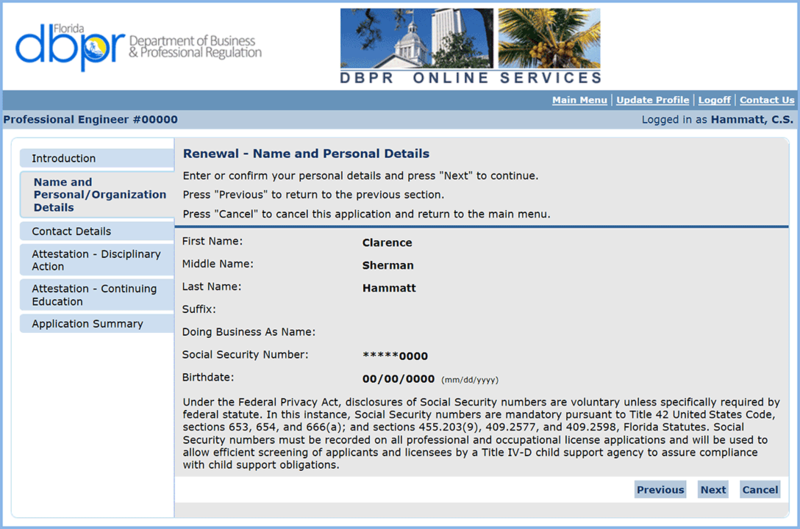 From the License Menu page, select “Renewal” under Functions. Carefully read the information on the Renewal Introduction page, as well as on subsequent pages. Select “Next” to continue renewal. Confirm the information on the Name and Personal Details page, then select “Next” if it is correct. Confirm the information on the Address Detail Summary page, then select “Next” if it is correct, or the blue, underlined “Main Address” link if your address needs to be updated. 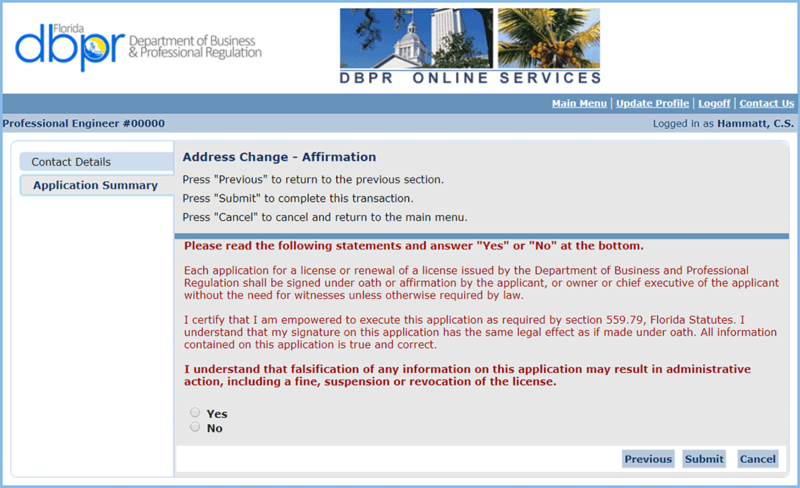 On the Attestation – Disciplinary Action page, certify whether or not you have had any legal action against your license in another jurisdiction by selecting either “Yes” or “No,” then clicking “Next.” If you selected “Yes,” you must provide an explanation and a copy of any Consent Order or Final Order to FBPE. Email that information to board@fbpe.org. On the Attestation – Continuing Education page, certify that you will have met the CE requirements for the current biennium as of March 1, 2019. If your license is currently inactive, select “inactive” from the drop-down list. 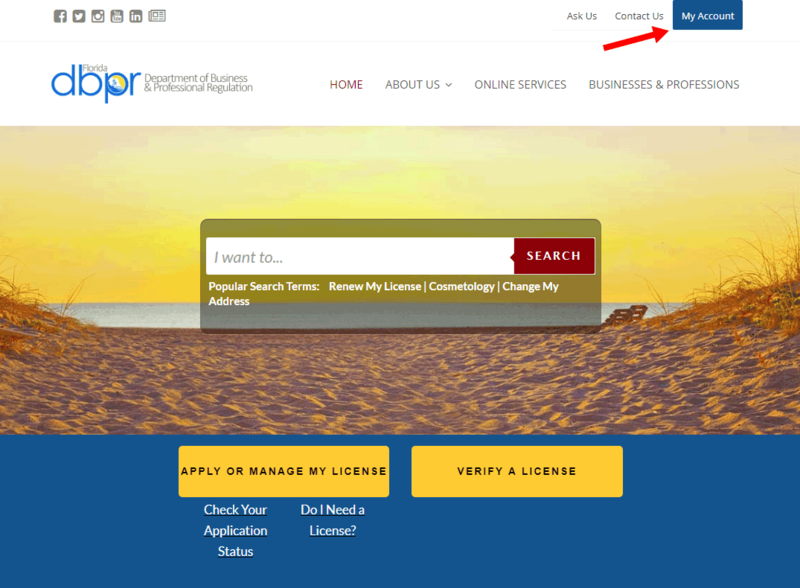 If you obtained your license by exam in 2017 or 2018, and Florida is your first state of licensure, choose “Exam” from the drop-down list. Otherwise, select “Yes” or “No” from the drop-down list. On the Application Summary page, review the information, then press “Submit” to continue, or “Previous” to go back and make changes. 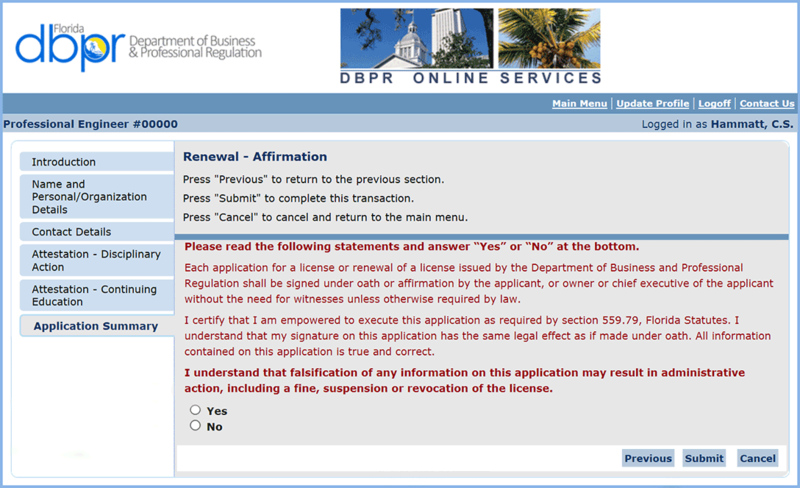 Next, affirm that you have understand the penalties for providing false information in the application by selecting “Yes,” then click “Submit” to complete the renewal process. The next page confirms that your renewal application has been submitted and presents you with the fees associated with licensure renewal. 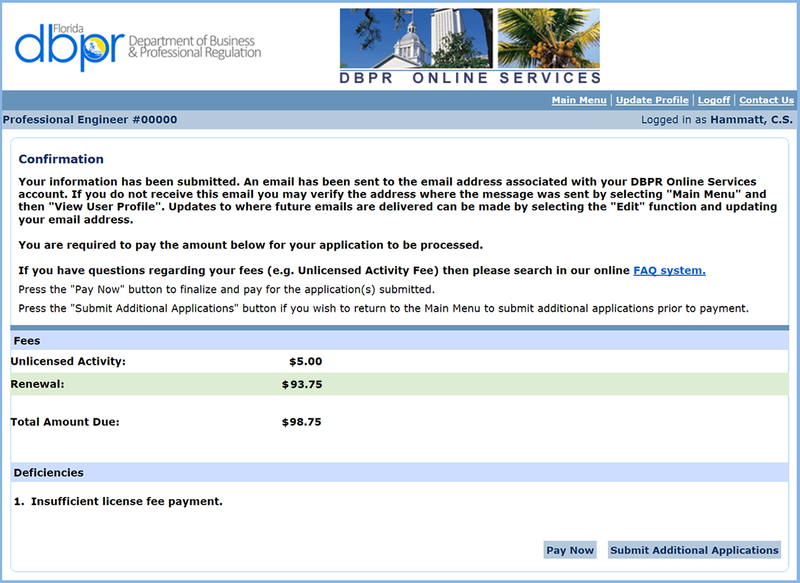 You will receive an email with your renewal summary attached. You now have the option to “Pay Now” or “Submit Additional Applications,” which will allow you to combine multiple renewals into a single payment. Renewal fees can be paid online with either a credit card or an electronic check (ACH). Review your payment choice and the renewal fee. Select “Next” to continue. Enter your payment information as instructed. Select “Next” to continue. If no issues occur processing your online payment, a Validation Number and a Trace Number will be shown. Print this page or save the numbers for your records. Then select “Next.” (Otherwise, go back to correct any payment errors.) You will receive an email containing your Online Payment Summary. 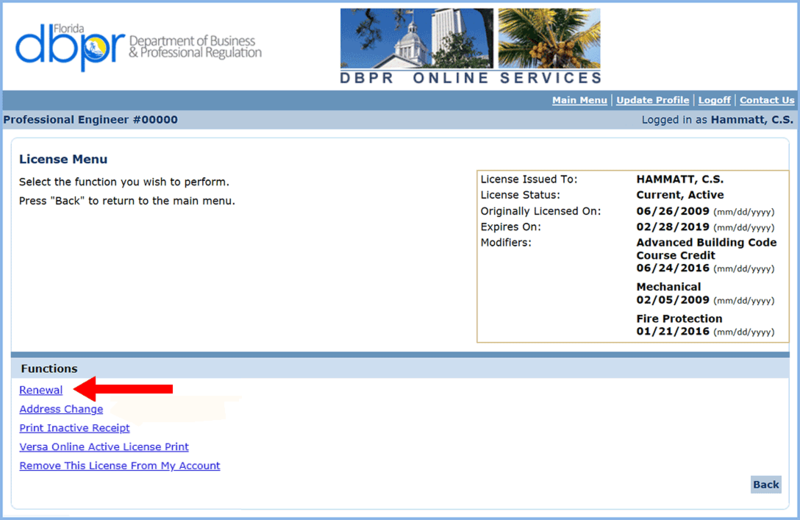 After you have successfully renewed your license and submitted payment, a new license will be automatically generated and emailed within 30 minutes to the address associated with your myfloridalicense.com account. Use the PDFs you receive to print your license and wallet card. 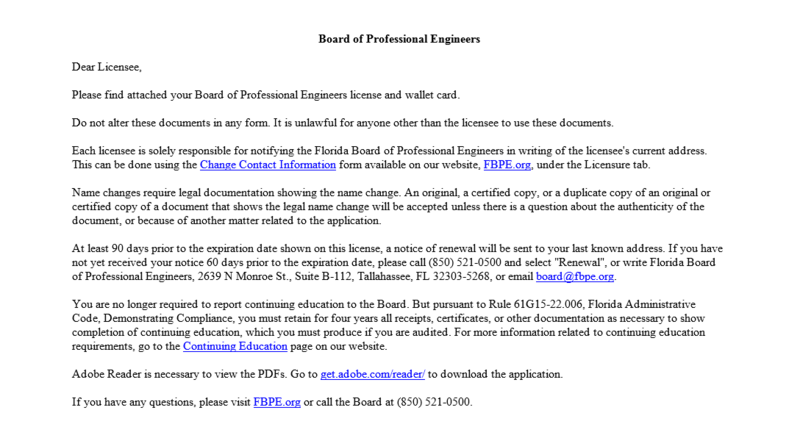 Professional Engineer licenses and Certificates of Authorization for engineering firms will no longer be mailed. 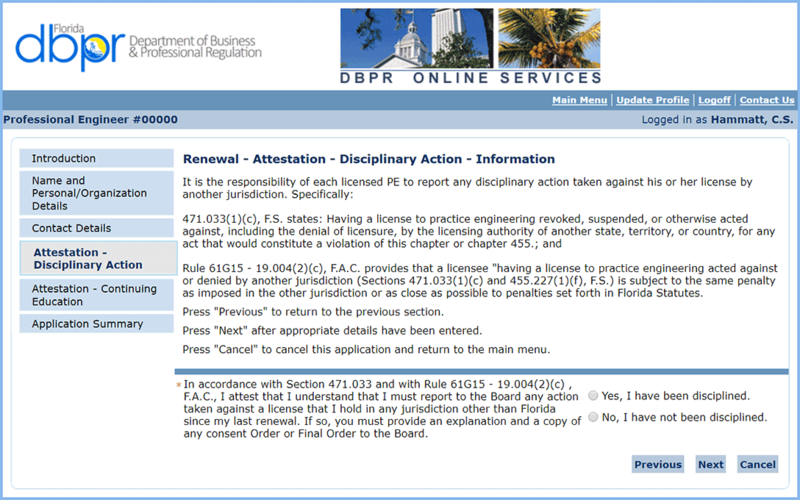 After you have successfully renewed your license and submitted payment, a PDF of your new license will be automatically generated and emailed within 30 minutes to the address associated with your myfloridalicense.com account. Special Inspector designations are renewed when your PE is renewed, but are not currently showing up on PE licenses. FBPE is working with the Department of Business and Professional Regulation to get the designation added to the new license format. Once the designations are added, you will be able to request a new printable license. Should you need a new license sent to you, follow these steps. 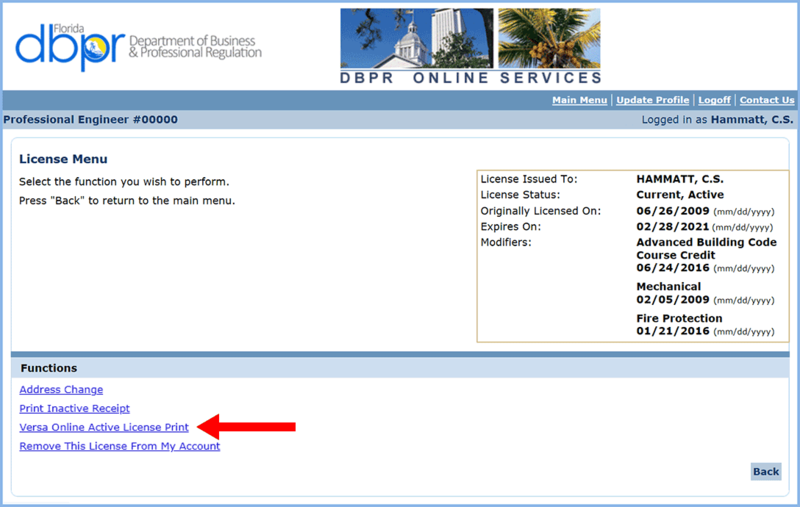 Return to the License Menu, then click the “Versa Online Active License Print” link. If your PE license is current but inactive, you will not be able to print your license. Please note the email address displayed on this page. It is the address to which your license will be emailed. This email address is the one that you used to log into your myfloridalicense.com account. Click “Previous,” then click “Next” to continue. 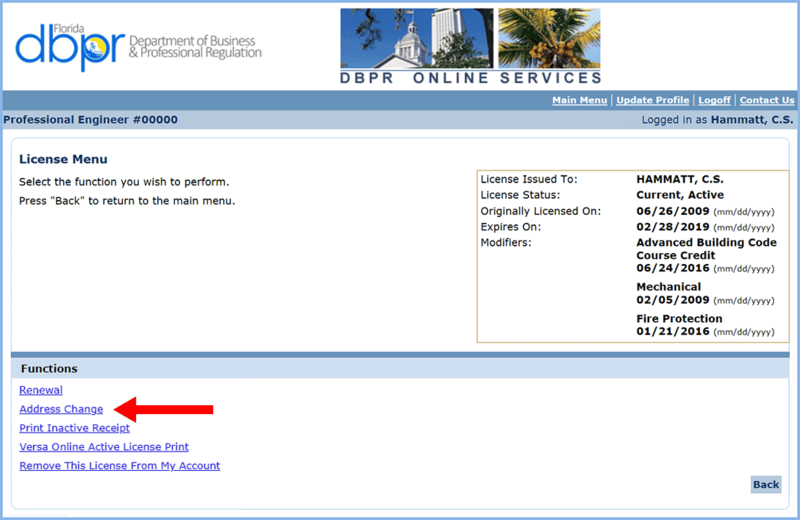 The next screen confirms that you have requested that your license be emailed to you. You will receive two emails following your request to print a license. The first email will contain a summary of your print request. Your license will be attached to a second email. The second email will contain an 8.5- by 11-inch license and a wallet card as PDFs. Use the PDFs to print your license. The second email, shown below, may take up to 30 minutes to arrive. Please check your junk mail folder if you do not see it. 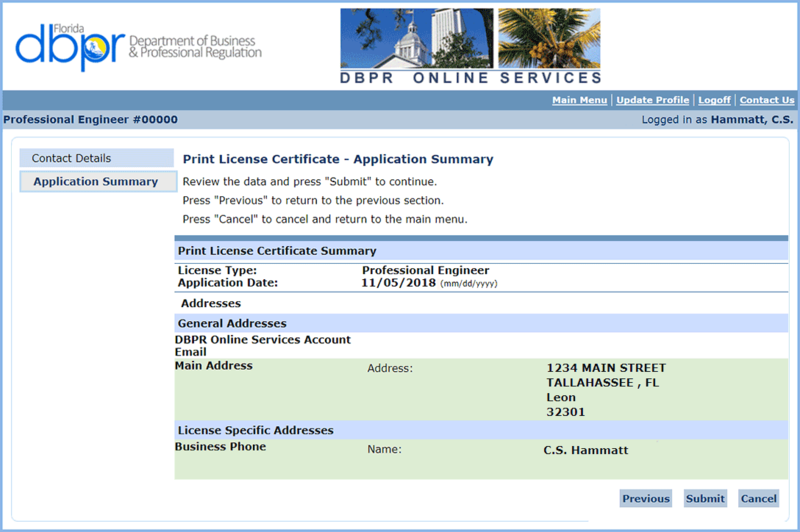 Should you need to reprint your license in the future, use the PDF that was emailed to you, or log into your myfloridalicense.com account and request that a new printable license be emailed to you.